The Burlington Fine Arts Association is an all inclusive group of visual artists who promote painting and sketching in Burlington. They have studio space in the art Gallery of Burlington and I paint with the sketch group there on Wednesday mornings and outdoors with their plein air group on Thursday mornings. The Ontario Plein Air Society (OPAS) promotes outdoor painting in Ontario. They organize paint outs, challenges and an annual show. I attend this groups activities as often as I can however they tend to be in or north of Toronto. I have taken many courses at the Dundas Valley School of Art and some over and over. Most notably portraits with Katherine MacDonald, Landscape with Catherine Gibbon, Oil Painting with Guennadi Kalinine and acrylics with Laurie Wonfor-Nolan. All of them have inspired me. Catherine Gibbon is in my mind Canada's best pastelist and the instructor who introduced me to the joys of painting outdoors.She is a fantastic mentor and friend. McMaster Gallery and Custom Framing is owned and operated by three perfect gentlemen. Bert has been doing all my custom framing for years and I wouldn't go anywhere else. ​The Dundas Museum and Archives has been a wonderful support to emerging artists. I have had a solo exhibition here and The Monday Painters just had their fifth annual group show there. 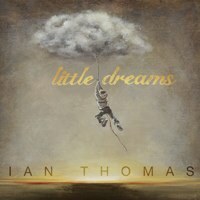 Ian Thomas is here partly because he is a home town icon whom I am proud to call a friend but mostly because his music, especially his latest album Little Dreams, is my painting music of choice. "Little Dreams" is a collection of songs reflecting on his life as he approaches becoming a senior and it perfectly expresses where I am right now in this journey we call life. ​In the Footsteps of the Group of Seven - Hearing Jim and Sue Waddington inspired me to take my paints into the bush with me and to pay more attention to the Group of Seven. Finding out from them that I had painted in the exact location as AY Jackson had years before was thrilling and it got me thinking about other locations that The Group of Seven had painted and I started looking for them. The group is iconic and to stand and paint where they painted is, for me, a huge thrill.